Students welcome a visit from Shemiah Curry, a Young Adult in Global Mission recently returned from service in Rwanda. Greetings to you in the name of Christ! You may notice that this newsletter looks a little different than ones past. Starting this month, LMHE will be moving from a twice yearly print newsletter to shorter, more frequent electronic news updates. It is our hope that this will allow you to keep up with what's going on in campus ministry and see more great pictures in an easily digestible format. Keeping you up to date is important to us because we have so much good news to share with you. As you'll see in the articles below, our students are engaging their faith in all kinds of ways -- from learning about relationship ethics to building interfaith relationships to working on mental health issues and more. We hope that in reading through these updates, you will be inspired by what God is doing, just as I am inspired by these smart, faithful students every day. Thank you for your prayers and your support. Without them, this critically important ministry simply would not be possible. Queens College student, Susan Rethinasamy (left) and Campus Minister, Anna Lutz on the Queens College Quad. Campus ministry is often the place where future pastors and church workers begin to discover their own sense of calling. Anna Lutz, the new campus minister at Queens College, is no exception. Anna grew up in Central Wisconsin and though faith was always an important part of her life, it wasn't until she got involved with campus ministry that she started to discern her own passion and gifts for ministry. She had the opportunity to work as a "housefellow" at Peace Lutheran Campus Center at University of Wisconsin - Stevens Point. As she helped organize events, led bible studies and built relationships with students, she discovered a love for ministry, especially with youth and young adults. Last year, Anna went on a mission trip with Peace to New York City, where she visited Immanuel Lutheran Church in Whitestone, the congregation that partners with LMHE to run the ministry at Queens College. When Anna met the church's pastor, Rev. Johnson Rethinasamy, and he told her that Immanuel was looking for a new youth and campus worker, she sensed that God was calling her to use her gifts in a new place -- Queens. In August, Anna moved across the country and began her work at Immanuel, where she serves as youth ministry worker, and at Queens College, where she leads The Vine Queens College branch of the citywide Vine network. Anna has been busy in her first few months on campus. In addition to The Vine QC's established weekly Monday bible study and Wednesday fellowship lunch, she has also started a regular women's bible study for female students. Under her leadership this semester, The Vine QC's students have been doing more to engage the broader campus, including hosting a pumpkin patch on the quad, co-hosting a Thanksgiving Feast with the Newman Club and participating in a campus-wide event on Trauma and Religion. For Anna and the students she serves, the location of The Vine QC's office in the Student Union near other religious groups is a real blessing. She remarked, "Across campus I can see God at work in the different groups and people that I have had the opportunity to work with. We are on the same floor as the Catholic Newman Center, the Muslim Student Alliance and the Hillel Jewish center. This puts us in an ideal position to witness, to welcome, and to be examples of God's love to our neighbors." Dr. Kate Ott leads a workshop on sexual ethics and faith. Students from schools across the city gathered in the sanctuary of Broadway Presbyterian Church on a Sunday evening in October to talk about a topic that many students don't associate with church: sexuality and relationships. Christian Ethicist, Dr. Kate Ott, engaged students from across The Vine citywide network in conversation about how they can live out relationships and make decisions about intimacy that are based in their values as people of faith. The workshop was called More than Consent, explained Dr. Ott, because "the conversation about sexuality on campus these days is all about consent and that is important, but as people of faith, we need to move beyond that one criterion and think deeply about how to be in relationships that are physically, emotionally and spiritually healthy." The conversation gave students the chance to reflect on their own experiences on campus, ask questions and wrestle with some of the dominant messages our society sends about sexuality. Dr. Ott, who is a Professor at Drew Theological School in Madison, NJ, shared her own robust Christian sexual ethic and encouraged the 14 students who attended to try applying it in their own lives. Columbia College Student, Michelle Goff (second from left), asks a question during Dr. Ott's workshop. While the workshop with Dr. Ott was powerful, it was just the beginning of the conversation. Union Theological Seminary Students, Cassie Hartnett, a trained faith and sexuality educator, and Jane Ulring, The Vine's intern, are now convening a six week small group for students to continue talking about what it means to embody healthy, faithful relationships and sexuality. Each week, participating students gather to talk about their lives, to learn and to challenge themselves to align their relationships with their faith and values. The workshop and ongoing small groups were made possible because of a grant from the Phillip N. Knutson Endowment for Lutheran Campus Ministry. Thank you to the Knutson Foundation for your support of this valuable program! Faces of Campus Ministry: Meet Sara Schott! 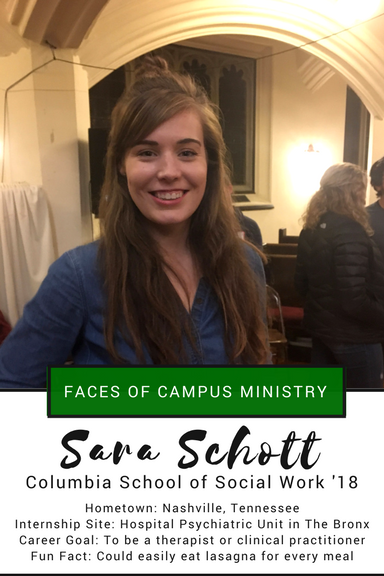 Columbia Social Work Student, Sara Schott, is the first student to be profiled in our new Faces of Campus Ministry series that will be posted on The Vine NYC's Facebook Page. Like and follow us on Facebook to meet a new student each week. Sara is active in LaMP, The Vine's ecumenical branch in Morningside Heights, where she is a fixture at LaMP's weekly dinner worship. Sara's education in Social Work has gone far beyond the classroom: in her first year, she interned at the International Rescue Committee and had the opportunity to work directly with refugees in New York City. Last spring, Sara led the LaMP student community through a powerful refugee simulation that she created to help educate the public about the struggles faced by people fleeing their homes and countries. This year, she is an intern at Jacobi Medical Center in The Bronx, where she works in the Comprehensive Psychiatric Emergency Program. Sara has a passion for mental health and hopes to become a clinical practitioner. As a United Methodist, Sara's faith is integral to her sense of vocation and she values being part of both campus ministry and a local congregation. Thank you for being part of our community, Sara, and blessings to you on the rest of the semester! Save the Date for Trivia Night 2018! 2017's winning team from Our Saviour's Atonment Manhattan. Save the date and start brushing up on your random facts -- LMHE's Annual Trivia Night Fundraiser will be back on Friday, February 23, 2018 and better than ever. Once again, teams of six will be invited to join in the fun at Gusatvus Adolphus Lutheran Church and compete in this epic trivia competition to support campus ministry in NYC. Start recruiting a team from your congregation or community and stay tuned for registration details in our next newsletter. Do you love thinking up trivia questions? Have a creative streak? Enjoy welcoming folks? LMHE is also seeking volunteers who want to be part of our planning team or our event crew during Trivia Night. Please email Pastor Becca if you are interested in helping out! AdventSageous, the 2017 team from Advent Manhattan, shows off their fabulous sign.